Aangel is a loving teenager with a smile that can light up any room. Aangel also has a great sense of humor. She is always telling jokes to make other people laugh. Aangel enjoys watching and playing sports. She enjoys playing basketball and football, and wishes to play on a team some day. Aangel in an animal lover and enjoys having a pet to take care of. She loves dogs, but is not a big fan of cats. She also likes bunnies and currently helps to care for one at her placement. 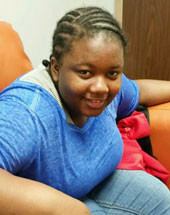 Aangel enjoys playing UNO, board games, listening to music, and dinning out. Seeing the beach and putting her feet in the water is on her bucket list.